Throw, drop, or place your Seed Bomb anywhere you want to feed deer and other wild animals. Each Seed Bomb contains over eight kinds of foraging plants deer love. These seeds will attract deer, elk, birds and more! No crushing or stomping the Bomb is necessary. Just water the Bomb or wait for the rain to fly. 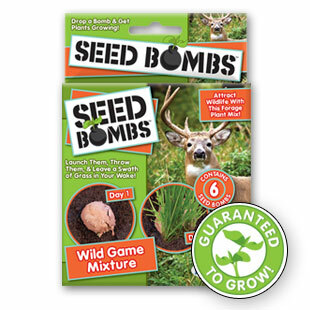 Your Seed Bomb will sprout with vigor and you will have a delicious selection of plants deer can eat within weeks. The specially developed clay and peat used in making the Seed Bomb traps moisture for the seeds when they need it most and protects seeds from birds, animals, and other predators. Will grow plants (bloomed or harvestable) in about six weeks! Six Seed Bombs per package. Grows a mix of: Buckwheat, Burnet Dealer, Brome California, Clover Crimson, Turnip Purple Top, Chicory Trigger, Fescue Chewings, and Hairgrass Tufted seeds. Seeds are protected by clay and peat moss, which also helps absorb moisture. Each seed bomb covers about one square foot of earth in plants. Each Seed Bomb is approx. 1" in diameter.